Now, since it just so happens that I’m sitting next to Charlie Dunlap at this bombing workshop, so I’ve had time to ask him directly about where he sits in all this and what he meant by the term. He tells me he agrees that the term has generally been misused and over-conflated. But his own understanding of lawfare is a little broader than the one I’ve put forward at the Duck, though significantly narrower than Stephanie’s or Eric Posner’s. In short whereas I read Stephanie as arguing that “lawfare” should refer to all efforts to hold states’ accountable to the law, Dunlap refers to the ways in which law is used as a weapon in war by belligerents. However I was wrong in thinking that he primarily refers to the near-perfidious use of the law by insurgents who, for example, are known to surround themselves with civilians simply because they know it makes ISAF troops less likely to target them. 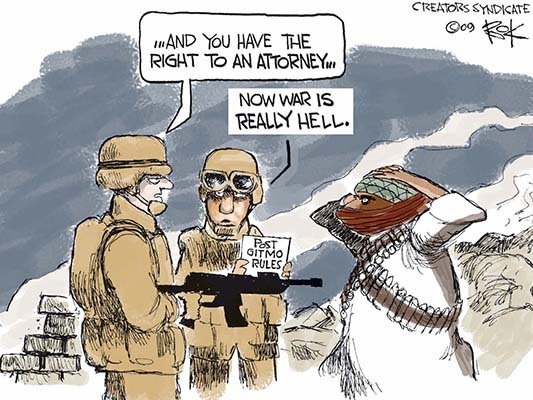 Dunlap also considers it “lawfare” when law-abiding states use their own adherence to the law to their own advantage – when ISAF, for example, advertises its civilian protection policies to win hearts and minds. So it’s a belligerent-focused concept, not necessarily one that focuses only on perversions of the law. This is quite distinct however, from the argument that “lawfare” is being waged by non-belligerents (NGO advocates and such) by definition when they call states to question for violating war law. If you have any interest at all in this topic, I highly suggest that you read it. Everyone uses the term differently and it’s being used to describe entirely different phenomenon. I’m therefore not sure how useful the concept is. Maybe it just refers to the political battles over the law which have always existed, but intensified after the Cold War. So I don’t/didn’t think lawfare should just refer to all efforts to hold states’ accountable. I definitely do not agree with Posner’s position. It’s not just academics criticizing states to score political points, but it’s also states using the law to score their political points. I basically saw it as a point scoring exercise by everyone. But I would concede that this is, perhaps too large of a definition. Dunlap’s comments on his use of the term – as a way to get states to take IHL seriously (which until the mid-1980s was taking a bit of a beating in the wake of Vietnam) – meshes pretty well with my research on attempts of US military lawyers to do just that. How’s that? (Seriously – I’ve really enjoyed the feedback on this.) Unfortunately, I don’t have Dunlap to ask – but, um, my Dad thought that sounded good. So there!